There's nothing like using a wooden chopping board for cutting meat and vegetables. I like how it has 'character' - those shades of brown and crooked lines. It holds well and isn't slippery. 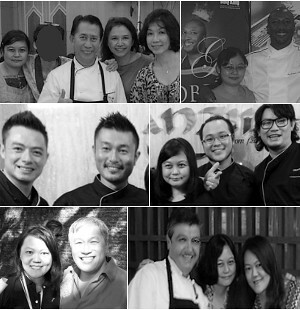 Having a good grip on things when I'm doing some major chopping and slicing is important to me. I also own a couple of white plastic cutting boards but don't feel the same exhilaration, and use it only to slice bread, cakes, fruit, the sort. This is just me. When it comes to cutting boards, I believe it's always important to use what works for us because it makes us feel more confident with the knife. A wooden cutting board requires some care. To keep it from cracking out of dryness and prevent it from mold, it is important to 'season' it with oil. Not just any oil though! I learned from various articles on the net that regular cooking oil such as vegetable oils and olive oils are a no-no because it will turn rancid. Best to go for walnut oil or almond oil (if you're not allergic to nuts), or food grade coconut oil. Some recommend using food grade mineral oil with beeswax. I'm more comfortable with something like coconut oil. So, that's what I'm going with. There are various advice on how to oil a wooden cutting board. I like things simple so I go with rubbing oil all over the board with a clean cloth, waiting some hours and oiling it again. If I'm not satisfied with the results (say it looks too dry), I repeat the process. Then, I'm done. 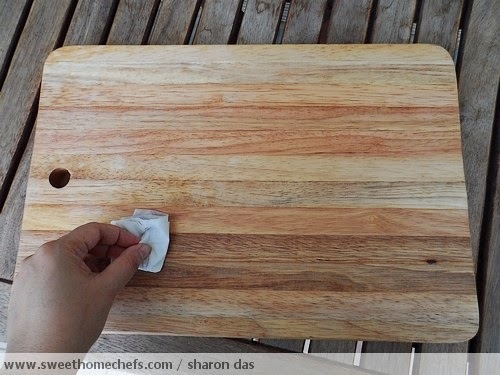 I've stopped using wooden chopping board many many years ago as it harvest bacteria. I've been using the glass board & loving it! I own maple and cherry cutting boards. The site www.woodcuttingboardsguide.com gives a good comparison. I recently purchased a bamboo board. I use lemon to clean my boards. I fou d your site looking for blogs on cutting boards. I have been using mineral oil for years for the initial finish and then a mineral oil and beeswax finish. I am so glad that you have posted this information for everyone to learn how to properly take care of their boards. I have been making cutting boards for years, check out my blog. thank you so much for stopping by my site and for the nice comment on my woodwork! When I visited your site the other day I printed your Lemon and Rosemary Roast Chicken recipe and I plan to try it this week, thank you!